The 100th anniversary of World War I has created a new renaissance of scholarship reexamining the major events of the conflict, including many previously under-reported battles and campaigns. Gallipoli, the Allied amphibious landing turned debacle on the shores of modern Turkey is one such battle. This volume in the outstanding series edited by Sir Hew Strachan is authored by Jenny Mcleod, a Senior Lecturer in 20th century history and co-founder of the International Society for First World War Studies. This book continues in the same vein as other volumes in this series by examining the battle within a history as memory context versus simply writing a new battle narrative. This is a significant achievement as Mcleod goes beyond the Western-centric viewpoint of examining the battle through the eyes of primarily a British, Australian, and New Zealand perspective to offer a critical new examination on the battle's heritage and memory for the Ottoman Turks as they transitioned from empire to republic in the wake of the war. For Australia and New Zealand, this campaign was their ultimate contribution to the Commonwealth Great War effort; and ANZAC Day, celebrated in Australia annually on April 25, is practically a national holiday. Macleod examines the origins and growth of this holiday and how the Gallipoli campaign continues to resonate with Australians and New Zealanders as a sort of “coming out” event when these countries began to assert more of their own identity as nations within the Commonwealth. For the British and Irish, the battle never assumed importance compared to other bloody campaigns such as the Somme and Passchendaele, and in fact was deliberately recast as a “glorious defeat” instead of the ill-conceived bloodbath it became. As Macleod correctly points out, even if the British had somehow gotten off the peninsula, the Turks had completely mined the narrow channel of the Dardanelles, rendering it impassable to the British Mediterranean Fleet, making the entire objective of the campaign unachievable. For the Turks, the battle defined their place in the post-Ottoman era, helping to overcome the trauma of defeat and dismemberment of their empire after 1918. The consequent rise of Mustafa Kemal, one of the heroes of the campaign for the Ottomans, sealed the battle’s place in Turkey’s culture and heritage. An important examination of the battle as memory was the discussion of the direct fallout of the battle of the First Sea Lord, Winston Churchill, an early advocate of the campaign and how the campaign contributed to his fall from grace in the War Cabinet. Yet an opportunity was missed to discuss the near term ramifications of the battle on the strategic thinking about amphibious warfare between the World Wars and the impact of the debacle of Gallipoli on British enthusiasm for the greatest invasion of World War II, D-Day. Several authors have noted British reluctance regarding a direct assault on Normandy based on senior commanders’ experiences in the Somme and other Western battlefields. One has to wonder what the impact of their being pushed back from the Dardanelles had on senior British generals and their prime minister. This would have been an interesting aspect of the history as memory approach as the battle and its representation in Britain between the World Wars most likely had a more profound effect on British strategic thinking than previously understood. 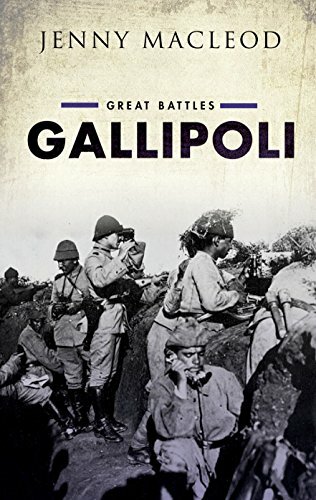 Overall, this little volume succeeds admirably in reexamining the battle of Gallipoli as a hallmark of World War I tactical futility in spite of the overwhelming bravery shown by both sides, a testament to mechanized killing made worse by strategic blundering.